As Ludwig Maximilian University of Munich physicists demonstrate in a new study, the optical and photocatalytic properties of so-called carbon dots can be precisely tuned by controlling the positions of nitrogen atoms introduced into their structure. Thanks to their unusual optical properties, carbon particles with diameters on the order of a few nanometers - so-called C-dots - show great promise for a wide range of technological applications, as diverse as energy conversion and bio-imaging. Moreover, C-dots have several practical advantages over comparable materials insofar as they are easy to fabricate, stable and contain no toxic heavy metals. 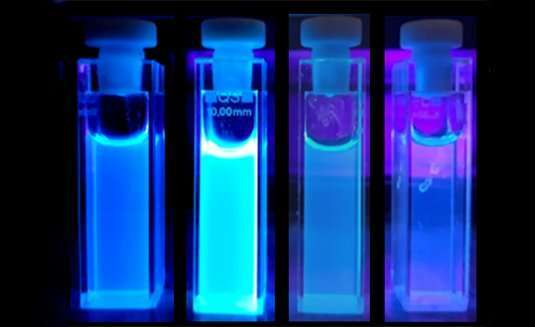 Their versatility is largely due to the fact that - depending on their chemical composition and aspects of their complex structure - they can either act as emitters of light in the form of photoluminescence or function as photocatalysts by absorbing light energy and triggering chemical reactions, such as water splitting. However, the factors that determine these disparate capabilities are not well understood. Now LMU physicists led by Dr. Jacek Stolarczyk have taken a closer look at the mechanisms underlying these very different properties. Their study, which appears online in the journal Nature Communications, shows that the physicochemical characteristics of these nanomaterials can be simply and precisely tuned by introducing nitrogen atoms into their complex chemical structure in a controlled manner. "Up until now, C-dots have typically been optimized on the basis of the principle of trial and error," says Stolarczyk. "In order to get beyond this stage, it is essential to obtain a detailed understanding of the mechanisms that underlie their diverse optical characteristics." The study was carried out as part of the interdisciplinary project "Solar Technologies Go Hybrid" (SolTech) coordinated by Prof. Jochen Feldmann. SolTech is funded by the State of Bavaria to explore innovative concepts for the transformation of solar radiation into electricity and the use of non-fossil, and preferably non-toxic and abundantly available, fuel sources for the storage of energy. C-dots are in many respects ideally suited for such applications. "Our investigation showed that the chemical environment of the nitrogen atoms incorporated has a crucial influence on the properties of the resulting C-dots," says Dr. Santanu Bhattacharyya, the first author of the paper and Alexander-von-Humboldt fellow in the research group of Professor Jochen Feldmann. Incorporation inside the graphene-like structures, found at intermediate polymer concentrations, led to the dots which predominantly emit blue photoluminescence when irradiated with light of a suitable wavelength. On the other hand, incorporation at edge positions, found for either very high or very low amounts of the polymer, suppressed photoluminescence and resulted in C-dots that photocatalytically reduced water to hydrogen instead. In other words, the optical properties of the C-dots can be modified at will by varying the details of the procedure used to synthesize them. The members of the LMU team believe that their latest insights will stimulate further work on the use of these intriguing nanomaterials, both as photoluminescent light sources and as photocatalysts in energy conversion processes.